The Trunk House is what Tom Hanks would’ve fabricated in Cast Away had he not been so involved with that dang volleyball (and, ya know, if he has a skill saw and some milling machinery lying around). 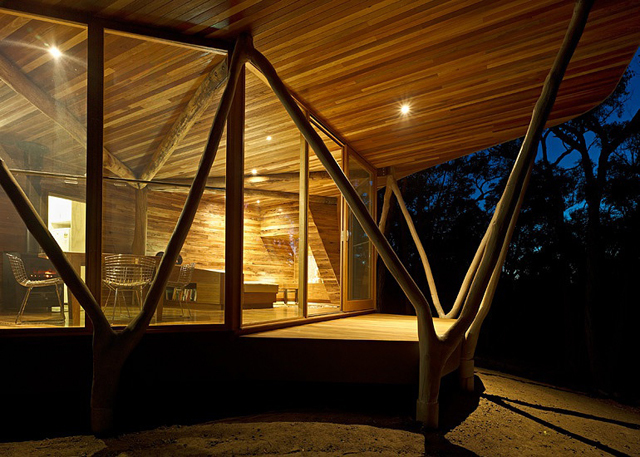 This small cabin designed by Paul Morgan Architectsin the Victoria’s Central Highlands of Australia is a shipwrecked traveler’s paradise, nestled in a forest of Stringybark. Most notable are the ‘V’ shaped support beams that zig-zag around the exterior, harnessing the natural load-bearing capacity of timber found locally by utilizing bifurcations in tree forks. Making this at the top of the list of the most unique Gold Coast vacation ideas. Turns out that the joints that are discarded in commercial logging have a great inherent strength, not to mention the Stringybark was milled, cured on site, and then fixed internally, resulting in a minimal carbon footprint. Trunk House:1 Loggers: Zilch.